Each area on the map is a link! About the Cherokee Looking for more information about the Cherokee Indians? Dollywood I can't help it, this is my favorite amusement park and a good value for the buck. Enter after 3:00pm and the next day is free. Take the Pigeon Forge trolly and save $$ on parking. Great Smoky Mountains Railroad "With the romance and mystique of an era gone by, guests on board the Great Smoky Mountains Railroad will enjoy scenic train journeys across fertile valleys, into tunnels and through river gorges in a spectacular region called The Great Smoky Mountains. " GSMNP Very informative site, you will find all the information you will need. Smoky Mountian Express Find all the up todate news and what's going on. 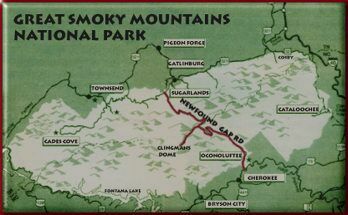 Smoky Mountain Planner is another site to help with your vacation planning.